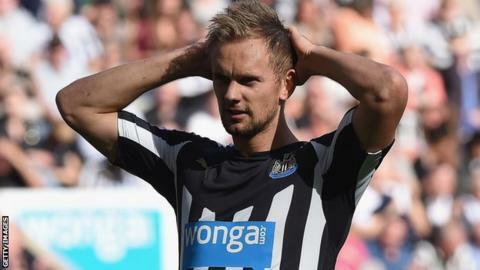 Newcastle's Siem de Jong could be out for a number of months after the forward suffered a thigh injury. The 25-year-old Dutchman, who joined United from Ajax in July, injured his right thigh in training and will be assessed further next week. "Initial indications are that he is likely to be out for a number of months," said a Newcastle spokesman. De Jong has made three appearances this season for the Magpies, who have yet to win a Premier League game. De Jong's injury leaves Newcastle boss Alan Pardew short of options in attack, with midfielder Hatem Ben Arfa having joined Hull just before the transfer window closed. The Dutch international played behind lone striker Emmanuel Riviere in United's last game - a 3-3 draw with Crystal Palace at St James' Park on Saturday. Pardew could turn to largely untried new recruits Ayoze Perez and Facundo Ferreyra, as well as midfielder Remy Cabella, to fill the gap left by De Jong. It is a also a personal blow to De Jong, who has suffered with injuries in recent seasons. He missed much of the last campaign at Ajax through injury and sat out a significant proportion of the Magpies' pre-season campaign with a foot problem.